The Princess Margaret was the daughter of George VI and Elizabeth Bowes – Leon, the current Queen Elizabeth II’s sister. In 1958, the third year after Princess Margaret officially left Colonel Townsend, Margaret began her second love. He was a professional photographer – Anthony Armstrong – Jones, later the Earl of Snowdon. 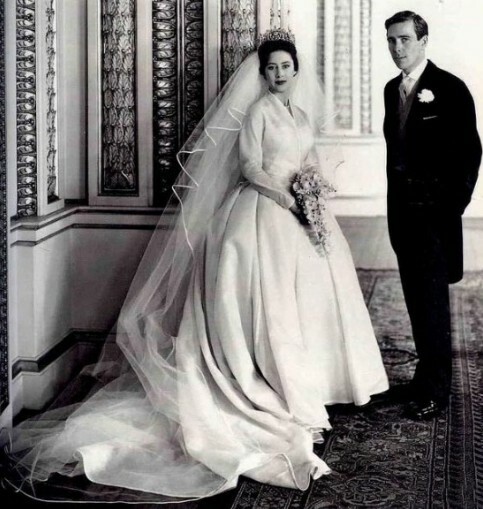 On May 6, 1960, Margaret married Anthony Armstrong – Jones at Westminster Cathedral. It is said that the day before Margaret Armstrong accepted Jones marry, Peter Dawson said to her that he was going to marry a Belgian woman. The wedding is the world’s first royal wedding broadcast on television. That day the number of audience watching the television would be 300 million. 1961, Margaret’s husband became the Earl of Snowdon, as outsiders she was also known as Countess Snowdon not Royal Highness any more. Anthony Armstrong is a bohemian of the upper society people who have the temperament of bohemian artists. The friends he made were mostly actors, musicians, dancers and interior designer. It was this unique temperament and artistic taste that fascinated Marguerite. She found resonance from his body. Margaret is the most uninhibited free individual of the members of the British royal family. And in the public’s mind, her beauty and the youthful love story were more attractive than her position and title. 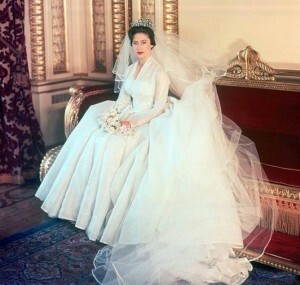 Princess Margaret’s wedding dress was designed by Norman, a royal designer. White silk dress, and long-sleeved V-neck jacket-style corset, these were parts of Marguerite’s classic elegance. This dress was coupled with silk yarn and added another simple and wide skirt decorated with ivory. Whether the clothing or veil, Princess Margaret would have to show the most elegant in them, of course including the amazing Poltimore Tiara headdress. This Princess Crown was gained prior the engagement announcement of Margaret and Anthony Armstrong Jones. And it appeared as the bride headdress for the first time. In the 1870s, headdress was composition of diamonds, gold and silver, coupled with old-fashioned pattern cutting technology. What was striking is that it could be decomposed into a necklace and eleven brooches. The most sensational thing on the Wedding was done by Margaret’s close friend, Glen Connor. He sent an estate built on the island of Mustique to them as a wedding gift. The island later became the summer resort of British royal and Margaret’s permanent residence. The royal wedding in Britain has always called people’s attentions over UK and even over the world. In 2011, there were two grand royal wedding, the British royal Prince William with Kate Middleton in April and later, in July Zara Philips, the British Queen Elizabeth II’s granddaughter, with her boyfriend Mike, the England rugby star. It is needless to say about the former. Now let us know about the latter. The Princess Zara is known as adolescent because of piercing on the tongue. She was considered as “problem girl” of royal. She won Champion and was called the “equestrian princess”. She is also the 13th overall heir of the British throne. Zara Philips is known as the member of the richest rebellious spirit in British royal family she is unwilling to accept the shackles of the royal family. And she does not like tea, but often facing beer bottle to drink wine.